Beirut: US-backed fighters say they have captured Daesh’s last shred of ground in eastern Syria — but while its era of territorial rule may be over for now, there is near universal agreement that Daesh remains a threat. Daesh’s possession of land in Iraq and Syria set it apart from other like-minded groups such as Al Qaida and became central to its mission when it declared a caliphate in 2014, claiming sovereignty over all Muslim lands and peoples. Warfare wiped out thousands of its fighters. And, financially, its defeat deprives it of greater resources than any modern extremist movement has enjoyed, including taxes on its inhabitants and the proceeds of oil sales. What threat does Daesh still pose in Iraq and Syria? In its previous guise as an Al Qaida offshoot in Iraq a decade ago, Daesh navigated adversity by going underground, biding its time to rise suddenly again. Since suffering devastating territorial losses in 2017, Daesh has steadily turned again to such tactics. Sleeper cells in Iraq have staged a scatter-gun campaign of kidnappings and killings to undermine the Baghdad government. In Syria, Daesh fighters still have a presence in sparsely populated territory west of the Euphrates River in an area otherwise held by the Syrian government. 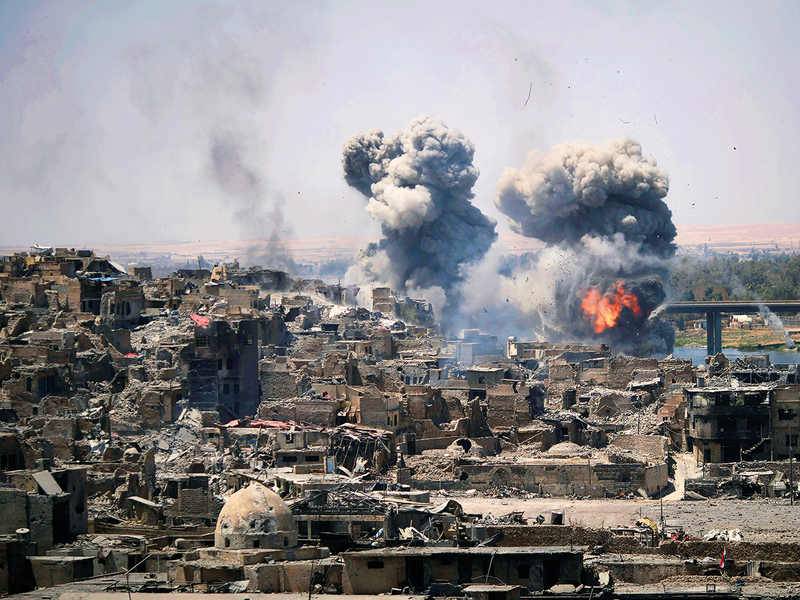 The US Pentagon’s internal watchdog released a report last month saying Daesh was regenerating functions and capabilities more quickly in Iraq than Syria. “Absent sustained (counterterrorism) pressure, [Daesh] could likely resurge in Syria within six to 12 months and regain limited territory,” the report said. The fate of Daesh leader, Abu Bakr Al Baghdadi, remains a mystery. The US government’s top experts strongly believe he is alive and possibly hiding in Iraq, US sources recently said. Other top-echelon leaders have been killed in air strikes. Thousands of Daesh insurgents and civilian followers have also been killed and thousands more captured. An unknown number remain at large in both Syria and Iraq. Iraq is putting on trial, imprisoning and often executing Daesh detainees. The US-backed Syrian Democratic Forces (SDF) holds many hundreds of Daesh fighters and followers, but the numbers have ballooned as the SDF advanced into the area near Baghouz. The SDF said over the past two months, more than 60,000 people had left the Baghouz enclave, including 29,000 surrendering Daesh supporters, 5,000 of whom were fighters. As Daesh clung to its last scrap of land, the head of Britain’s spy agency MI6 warned that the group would return to “asymmetric” attacks. Even after it began losing ground militarily, Daesh still claimed responsibility for attacks made in different countries, though often these have been blamed on “lone wolves” without its direction. In early 2018 the head of US military central command said Daesh was resilient and remained capable of “inspiring attacks throughout the region and outside of the Middle East”. What does its fall mean for the future of global extremists? Although Daesh’s core territory was in Iraq and Syria, extremists fighting in other countries, notably Nigeria, Yemen and Afghanistan, pledged their allegiance to it. Al Qaida also retains numerous franchises around the world, and other militant Islamist groups operate in countries where normal governance has broken down. Extremist ideology has long proven itself able to mutate as circumstances change, and there is no shortage of warfare, injustice, oppression, poverty, sectarianism and naked religious hatred for Islamist militants to exploit.